Fracture is told from Delaney's perspective, and if you've read the first two chapters, you know that she falls through the ice in chapter one, and she wakes up 6 days later. And what happens in between—well, that's Decker's story. Especially if it's your fault. 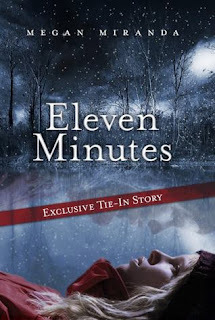 Eleven Minutes is told from Decker’s perspective, and it is a tie-in to Fracture. It is always nice to be able to read what happens from another character’s perspective, especially if that character is Decker. I adored him in Fracture, and I enjoyed learning more about him and getting his take on things. The story encompasses the eleven minutes Delaney was under the ice and the subsequent days she spent in a coma. Decker is desperate for Delaney to wake up, and he spends most of the time feeling guilty over the accident. While I knew he felt guilty for what happened, I had no idea how deep it ran until reading this. Decker’s story is heartbreaking and moving, and it made me love him all the more. This was an excellent tie-in story, and you can read it without having read Fracture beforehand (although I recommend you do so). Also, at the very end of this short story, there is a short explanation from the author. I liked learning about what intrigued her to write Fracture, just as much as I liked learning more of what happened during and after Delaney’s accident. Eleven Minutes really provides some amazing insight on both the characters and the author herself, so you should not miss out!